Stainless Steel Swing-Top Trash Can 13 gal. 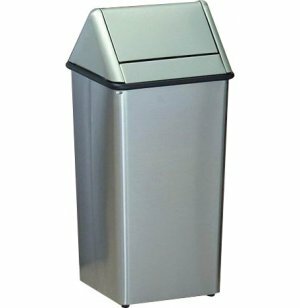 Keep your school, business or campus neat and tidy with this stainless steel trash receptacle from Witt Industries. Not only is it highly practical, it looks so good it actually adds to your décor. This small, hamper-style trash can features a swing-top that's both aesthetic and convenient for clients and guests. The stainless-steel construction is strong enough to stand up to heavy traffic and constant, daily use, and adds a sleek touch to any school or office environment. Its unique "flame-out" design smothers fires in seconds, making it an excellent choice for public places like campuses and malls with smoking zones. Fully ADA compliant, this trash receptacle is suitable for companies and schools privileged to cater to clients and patrons with special needs. Optional heavy-duty plastic liners are also available, for a cleanup made even easier. Convenience, durability, safety and even aesthetics, all in one little trash can. 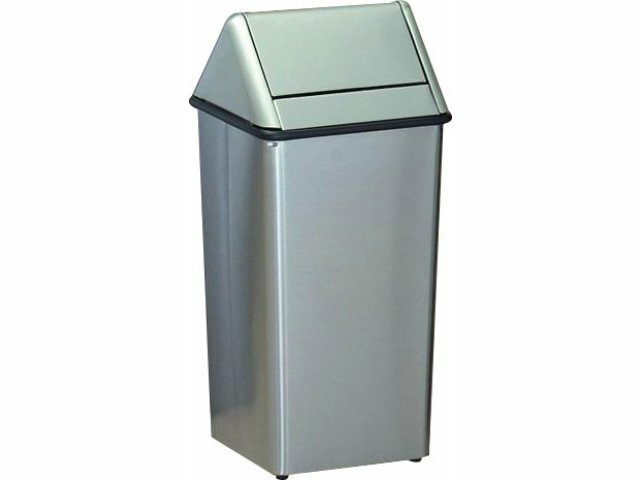 Attractive Design: Compact size and aesthetic stainless-steel design make this trash receptacle an attractive addition to offices, schools, malls, campuses and more. Highly Durable: Stainless-steel construction stands up to daily use, while four feet lift this trash can off the floor to prevent scratches and facilitate general cleanup.